Lisa Weese, left, is the owner of the Augusta Land Company. 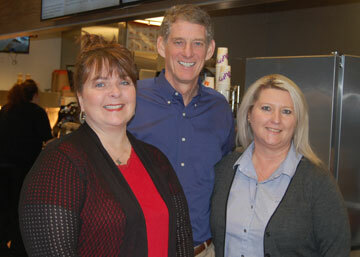 John Ebert, center, is the owner of McDonald’s in Philippi as well as 40 other of McDonald’s regional outlets. Lori Skidmore, right, is the General Manager of McDonald’s in Philippi. A life-long resident of Junior, Skidmore is a 1988 graduate of Philip Barbour High School and McDonald’s Hamburger University. She has been associated with McDonald’s for 29 years. McDonald’s is located in the Shop-n-Save Plaza in Philippi while the J. W. Ebert Corporation is situated at 917 West Main Street in Bridgeport. Skidmore has been recognized multiple times as the store Manager of the Year and Philippi’s McDonalds has been named several times as Outstanding Store of the Year. Augusta Land Company, LLC, is a land service company providing professional services for the oil and natural gas industry throughout West Virginia, Ohio, and Pennsylvania, and currently has title examination projects underway in Wyoming and Colorado. The staff of Augusta have 30 years of combined experience and are certified by the American Association of Professional Landmen. Augusta’s services include oil and gas title abstracts and ownership of surface, minerals, leasehold, and well ownership. Augusta also deals with mineral interest and ownership calculations, management for individuals and organizations, estate and heirship issues, leasing, mineral consulting, state regulatory and permitting processes, project management, title curative, title review, rights of way, acquisitions, joint ventures, mapping, timber sales, private property transactions, and settlement damages.